The recipe came from my neighbor, Betty. Betty and her husband have been together for over 50 years, and have a nice garden and many edible plantings. They cook pretty much everything from scratch. Regular readers might recognize Betty from her No Can Dill Pickles, abundant asparagus and pears, or horseradish patch. We’re blessed to have such friendly neighbors who are happy to share their excess harvest and favorite recipes. 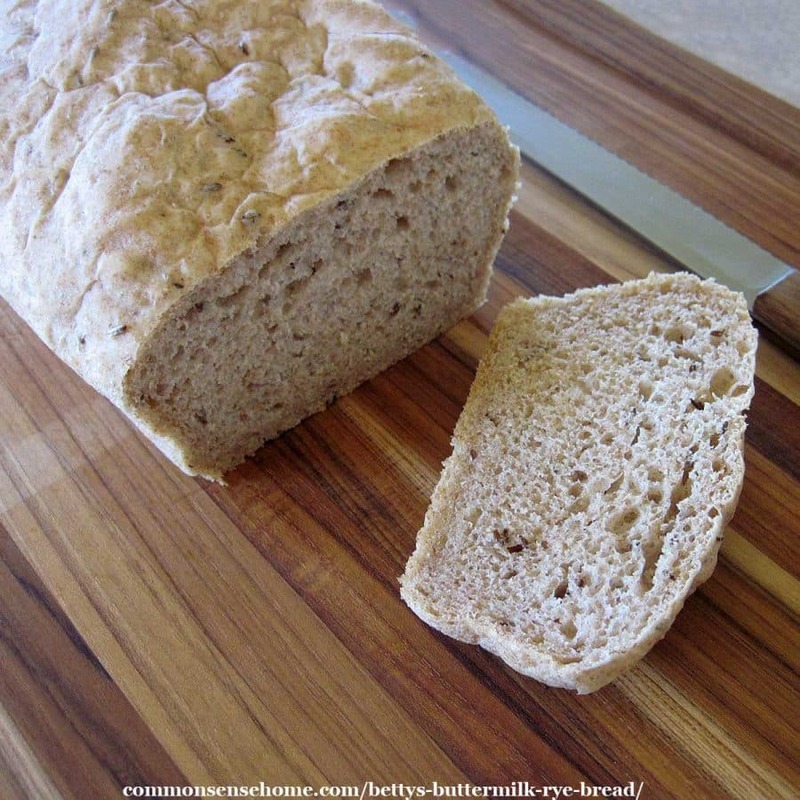 Betty makes this homemade rye bread in her bread machine. She uses a setting that makes the bread in 3 hours and 25 minutes. I mix up the bread in my Bosch stand mixer with dough hook and bake it the oven. I usually double the recipe and make three 9×5 loaves of bread. The buttermilk keeps this recipe moist, never dry. Organic rye flour is great if you have it available. You may use light rye or dark rye flour. I prefer organic caraway seeds, too. Remember, no matter which spices you choose, fresh is always best. Flavors fade as the spices age. SAF-instant yeast is more vigorous than active dry yeast, so you use a little less. The buttermilk adds acidity, making the yeast happier. (Some rye bread recipes add pickle juice for acidity, but this can lead to extra salty bread.) If you don’t have buttermilk, you may substitute milk kefir or sour milk or buttermilk powder and additional water. Bake your rye bread in a loaf pan or for a more rustic look, shape it into an oval and use a baking sheet. (Stoneware pans are great if you have them available.) A single batch makes one larger loaf (9×5) or two smaller loaves (8×4). 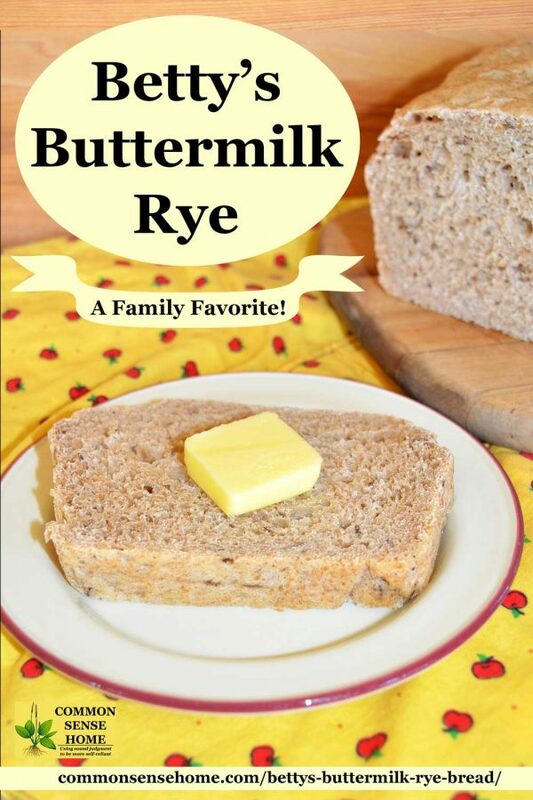 Betty's Buttermilk Rye Bread – Easy rye bread recipe for the bread machine or mixing by hand. Great texture and real rye bread flavor. If using a bread machine, load ingredients in order listed and choose a setting that bakes in around 3 hours and 25 minutes. If mixing by hand or in a mixer, blend milk, water, sugar, salt, caraway seeds, butter and yeast. You may substitute milk kefir or sour milk or buttermilk powder and additional water for the buttermilk if needed. I usually use milk kefir because that’s what I have on hand. Mix until yeast and sugar are dissolved. Add flour cup by cup until a slightly sticky dough forms. Knead for six to eight minutes. Cover and let rise for 20 minutes. Punch down down dough. Let rise again until about double in size. 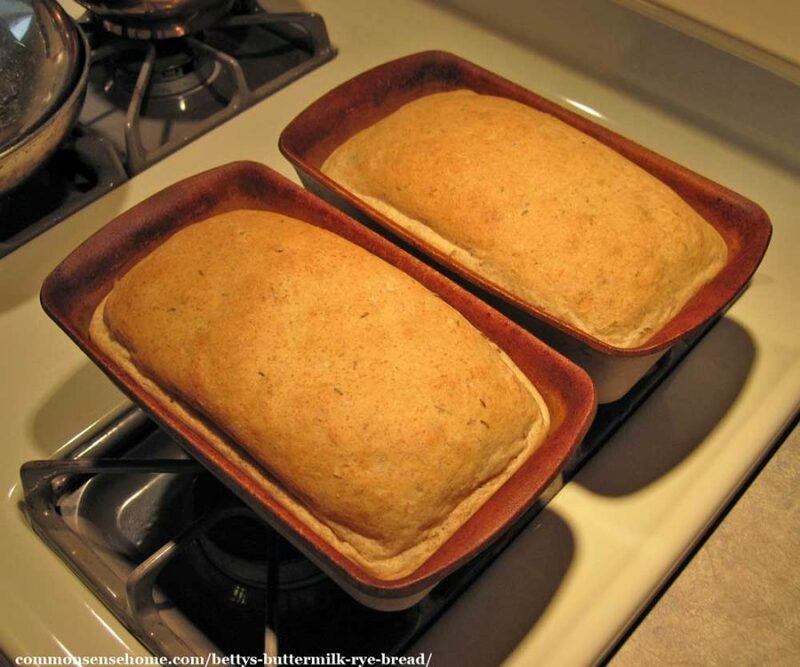 Form into one larger loaf (9×5 bread pan) or two smaller (8×4 breadpan) and place into greased bread pan. Place in a warm location, cover with a flour sack towel/lint free kitchen towel and let rise until double. Bake at 350 degrees F for 25-30 minutes, until lightly browned. Most of the time I double the recipe and make three medium loaves. The buttermilk keeps this recipe moist, never dry, and it makes a great sandwich bread. No, rye bread isn’t gluten free, whether it’s made with a combination of wheat and rye flour or rye flour only. Rye grain contains secalin, a type of gluten. Homemade rye bread, especially bread made with whole grain rye, is better. Many people find rye flour easier to digest. Studies have also linked whole grain rye to improved insulin sensitivity, lower cholesterol and reduced inflammation. Some people find “rye only” bread unpleasant, since it tends to be heavy and dense. A rye/wheat mix bread can help introduce rye into your diet. Is rye bread low carb? Alas, keto people, rye bread – whether rye flour only or a wheat/rye mix – is not low carb. Rye flour does have a lower glycemic index and plenty of soluble fiber. We also have tips for par-baking and storage, holiday breads and bread “go alongs” like flavored butters. 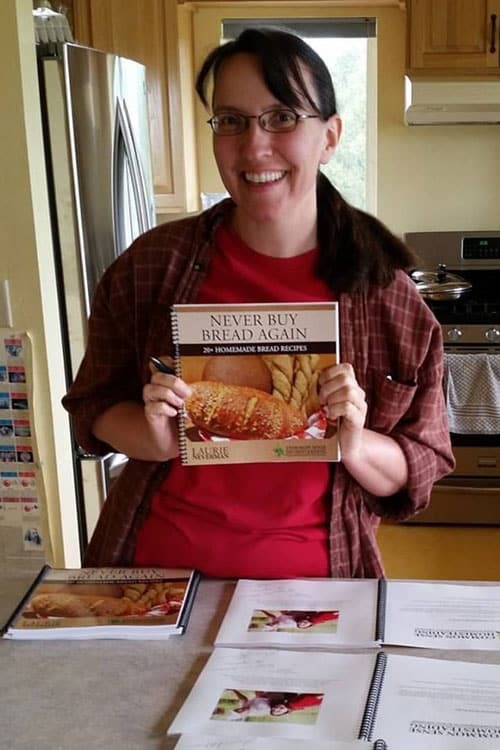 If you've ever wanted to try bread baking, or tried baking and baked rocks instead of bread, this book contains a detailed troubleshooting section. It's available in print and digital format for easy access. I'd love to send you a copy so you can join our many happy bakers. I hope you enjoy Betty's recipe as much as we do. Let me know if you have any questions or recipe requests. Originally published in 2013, last updated in 2019. Thank you for sharing your recipe as this is the 2nd time in a week I have used it. A light crunchy crust with perfect texture and easy slicing. I’ll make sure and tell Betty when we see her for piano lessons this week. I have made this bread twice and use organic plain yogurt, which when warmed becomes a liquid, in place of buttermilk. I never need the whole amount of flour….a 1/2 cup less. Many things can effect this so maybe that is the case here. Love this recipe. Thanks. What about soda bread. So easy and quick to make. I tried that once with oat flour and it didn’t work out so well, but I should try it again. Great recipe! I doubled the recipe and made two loaves. One in a bread pan the other I just shaped and put on a cookie sheet as it is. Both fabulous! I ran out of caraway seeds so in stead added sesame- and poppy seeds in the one and coconut flakes and honey (omitted the sugar) in the other. Thanks a lot! Looked high and low for simple rye bread recipe, and this was it!!! I loved the instruction,and had everything in ingredients,for a change. But during last 10 minute rise, it fell! I was so disappointed, baked it,and enjoyed it anyway. Great taste and texture! Thanks! Try to get it in the oven just a bit sooner if you can. Glad you enjoyed it anyway! hey what about coconut flour inmstead or white flour?? I have not tried substituting this recipe, but coconut flour tends to make a much heavier bread because it lacks gluten for loft.